Surgery day was April 9th, 2015. My second surgery. This time with a new surgeon in California. My first surgery was January 8, 2014 in New York. That first surgery recovery was extremely difficult. I expected this one to perhaps be better, but I wasn't sure since there are no guarantees. My fiancée Sarah drove me at 5am to La Veta Surgical Center in Orange, California, about an hour and 30 minutes from San Diego. It's not a hospital, so it offered a separate cash option that actually isn't that expensive compared to hospital costs. My new insurance did not want to cover my second surgery even though I see this operation as a necessity. It's not at all about my looks. My reason was to improve chewing, relieve pain and align my jaws properly so my left side stops clicking. I entered pre-op at 7:30 and dressed in a gown and those socks they call slippers. At 8:29 I climbed on the operating table. The clock said 8:29:04, counting the seconds. Surgery was scheduled to begin at 8:30. I looked up and the ceiling began to move. My vision was blurring. The anesthesia was kicking in. Here we go. I was out within seconds. I was on schedule. I woke up in the recovery room sometime in the afternoon. Above you see right before my second surgery and two days after here at home. The white pad on my chin was hard to peel off, but I was able to do it in about 10 minutes. It took a few days and some showers for the sticky residue to leave my face. 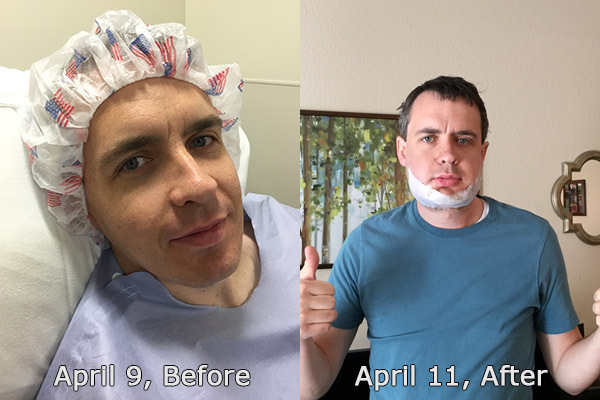 Below are the differences between this surgery in California in April 2015 and my previous surgery in New York from January 8, 2014. January 2014: 8 hours on the operating table. April 2015: 3-3.5 hours total operating time. An extra hour of the 3-3.5 hours was used to remove at least one or more loose plates and screws from surgery one. January 2014: Significant drooling for two weeks. April 2015: No drooling. January 2014: Extreme swelling. April 2015: Mild swelling. January 2014: Catheter inserted and removed from "down there". April 2015: No catheter. January 2014: Difficulty urinating in recovery. April 2015: No difficulty. January 2014: Chest bruising in recovery. April 2015: Chest bruising in recovery. January 2014: Significant difficulty in swallowing liquids first few days. April 2015: No difficulty. January 2014: Anesthesiologist had difficulty for over an hour in finding breathing pathway in nasal passage. April 2015: No issues. January 2014: Not wired shut. This sounds like good news, but my jaws did not end up aligning properly. April 2015: Wired shut for two weeks. As of writing this blog post three days later my jaws are perfectly aligned. My surgeon had an x-ray done the day after. He walked in and with a very elated voice said he was "VERY happy" with the result. January 2014: No breathing problems the first several days. April 2015: Some breathing issues only the first night, likely due to my jaws being wired shut. January 2014: Surgeon needed to put screwdriver through chin for some screws. No remaining scars. April 2015: No outer chin access needed. January 2014: No penicillin prescribed. Infection results in first few weeks. April 2015: Penicillin prescribed day one to prevent infection. January 2014: Talking significantly difficult with jaws not wired shut. April 2015: Jaws wired shut, yet talking is slightly easier to understand. January 2014: Had to stay two nights in hospital with severe recovery and discomfort. April 2015: Left same day to one night comfortable hotel stay. January 2014: Vomited blood after waking up. April 2015: Vomited blood this time too. Might be unavoidable. Not pleasant. January 2014: Extremely weak in first few days of recovery. Felt like blacking out a lot. Not able to walk until two days after surgery. April 2015: Able to walk up stairs same day. No black outs nor have I experienced any "almost" black outs. January 2014: Terrible first two nights. Only about an hour of sleep total for both nights. In agony. April 2015: Slept well the first night, only waking for medication. January 2014: Numbness significant around lips. April 2015: Numbness only slight. Able to feel top and bottom with only a bit of numbness. I am having an incredibly easier recovery this time around thus far, and hope to continue with a successful recovery in the weeks to come.